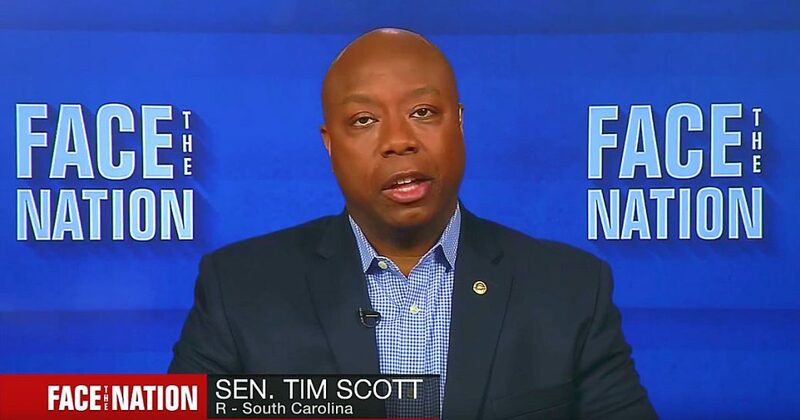 Senator Tim Scott (R-SC) can usually be counted on as the voice of reason, and he came through again for us on Sunday when he appeared on CBS’ Face the Nation to tell the media, the punditry, and the political class to quiet down with the Roy Moore outrage. Scott argued that unless they had proof of Moore’s indiscretions it was only the people of Alabama who could act as “judge and jury” in this case. Senator Tim Scott: Well, certainly, the allegations are very, very strong. The denial was not as strong as the allegations. I think, if the allegations are true, there’s no doubt that he should step aside, and not for the party, but for the American people. We have to find a way to restore trust and confidence in our elected officials, in our government. And this goes in the wrong direction. John Dickerson: In this case, though, if the allegations are true, he’s denying them. How do you find proof? What seemed interesting about what Mitt Romney said and Lee and Daines have said is, they have looked at the case as presented by “The Washington Post,” and that was sufficient evidence for them. Senator Tim Scott: Yes, there’s no doubt that the case is compelling. The judge and the jury in this case will be the people of Alabama, the voters of Alabama. They will have an opportunity to weigh in very clearly and decisively and very shortly. John Dickerson: Do you — what’s your reaction to some of the supporters in Alabama, Republicans, who have said, even if this is true, they still support Moore? That’s the voters of Alabama having their say, but does that have any effect on the larger Republican Party? Senator Tim Scott: Well, certainly, I think the reality of it, the voters will be heard. And we had very good candidates in that race. We had Luther Strange Mo Brooks, who was a classmate of mine when I came into Congress, both very fine men. The reality of it is that the ripple effect on the Republican Party is yet to be determined. The truth of the matter is, we ought to be a party focused on principles. And we should govern according to those principles. And when we find ourselves crossways with those principles, it’s difficult for the American people to understand what direction we want to take them. One of the ways that we solve that problem from a policy standpoint is tax reform. But this current situation will have to be solved by the people of Alabama. The voters will be the judge and the jury.